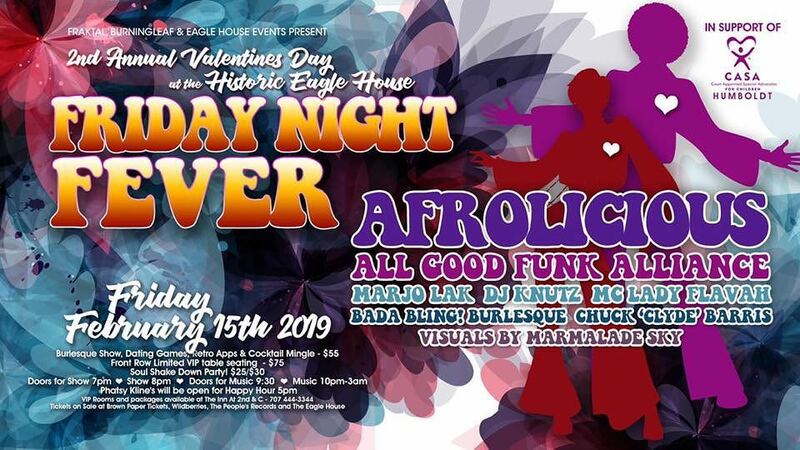 Friday Night Fever ~ A Funky Disco Valentines night of LOVE! Join us for a night of entertainment, live dating gameshows, burlesque and a soul shakedown dance party like you haven’t seen before! Hop on the Soul Train Dance Line, get with the Funk, time to get your disco on! Twerk Contest!!!! Sign ups will begin at 10pm! Retro Apps & Cocktail Mingle, Game Shows, Burlesque and Dance Party. * Start the night off with our Soul Train Mingle Hour, light retro appetizers & a Disco Drink of your choice is included. * Join our very own Chuck “Clyde” Berry as we take a trip down memory lane with our own version of the "Love Connection Dating Game” and “How well do you know your Lover” ~ Audience participation required! * Get your groove on with the Bada Bling Burlesque! The BBB is back and ready to get you sizzling and sausy! This is a FUNDRAISER for Humboldt CASA, a portion of the proceeds and money raised from the bar will go to support the advocacy for foster children in Humboldt County.